Artists across all genres are creating work in reaction to the election of Donald Trump and the state of the world at large. Now, songwriter and activist Billy Bragg has stepped forward with a song of his own. Titled "The Sleep of Reason," the song finds Bragg reflecting on the way things have gone since last year's United States presidential election. Bragg's website reveals the track is "the first of several songs Billy plans to release over the course of the coming months." Life comes at you real fast these days. What's a singer-songwriter to do when events keep challenging the way that we see the world? Before we've had a chance to digest one startling development, along comes another to throw us off balance again. I've been grubbing up songs for the past 12 months, but without the time to get an album together due to other projects, so I've decided to start dropping tracks as they become ready. As always, they're my way of trying to make some sense of what's going on. 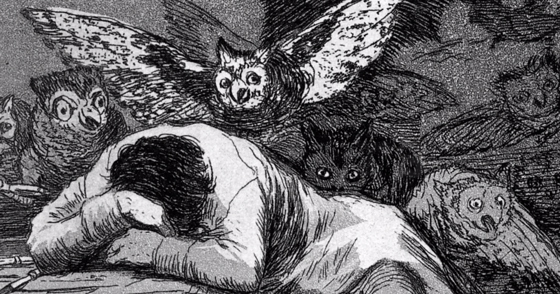 "The Sleep Of Reason Produces Monsters" is the name of an etching created in 1799 by the Spanish artist Francisco Goya. The title struck a chord with me when trying to understand the events of last year. The lies and hubris of the Leave campaign in our EU referendum were echoed and amplified by Donald Trump's presidential campaign. Only by restoring empathy and reason can we hope to defeat the monstrous forces of nationalism and untruth.